Parking is available in the church lot (free of charge) and also on the street. View map with directions. All are welcome. Please RSVP to Ann or 206.204.3855 by Friday, March 24. Strengthen our connections as congregations by gathering, engaging and acting as witnesses to God’s love and mercy. The Assembly is our major consultative event of the year. It is a time to gather with other members of the wider church, to hold rich conversations, to learn what is happening currently with the Church Council, and to inform our collective work. And, yes, there will be formal business, including reviewing the Church Council’s 2017 budget and affirming the Board of Directors and officers of the Board. We hope you can join us for this evening and leave inspired to: participate in the collective power of faith in action; connect with neighbor churches to mutually inspire and ignite one another as the Body of Christ; and, catalyze and collaborate for peace, justice and the well-being of all. All are welcome. 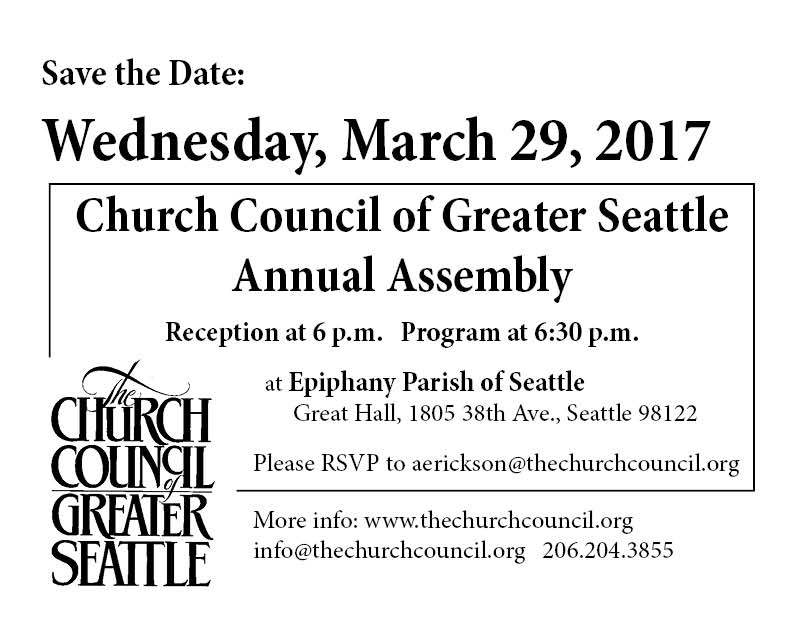 Please RSVP to Ann at 206.204.3855 by Friday, March 24.